Computers are massively small and massively cheap. They have become so cheap, shops now give them away with every purchase. They are so cheap that you then just throw them away without even noticing you had them. Did you get a DVD for Christmas? There was probably a computer stuck to the package - used just to sound an alarm if Santa walked out the shop without paying for it. Buying a new skirt with your Christmas money? It will probably be tagged with a computer too. These computers are called 'RFID tags'. Their job is just to communicate their identity to other computers (RFID readers) in the shop: like the ones connected to the tills and those controlling the door alarms. Each RFID tag has a unique identity: a number different to that of every other tag in the world. That means every single item in a shop that is tagged is announcing exactly who it is to any computer close enough that wants to listen. It isn't just saying it is a skirt, but saying it is a particular skirt. The store's main computer holds lots of information about it, that it can look up once it has that identity number. What information? Well, things like that it is a denim skirt, the make, the size, whether it is made of organic, fair-trade cotton, and whether it has been paid for (so is allowed to walk out of the store). 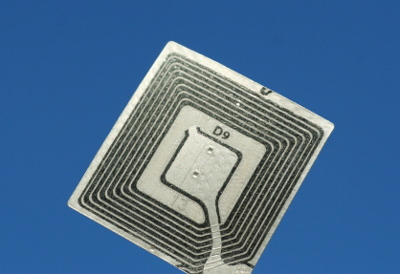 The simplest RFID tags consist of just a chip and a radio antenna. When they pass near a reader they send it the information they have stored - their identity - using a radio frequency. That is all RFID stands for 'Radio Frequency IDentification'. As they do a very simple thing - transmit their information when asked - the chip on a RFID tag is very simple. That is why they can be made cheaply enough to be throw away items - a few pence each. Simple they may be, but with a little ingenuity people have come up with all sorts of intriguing ways to use them. In shops they are used for stock control and as anti-theft devices - the main computer can keep track of every individual item that passes through the tills and through the door. They are used in travel cards in cities round the world as a way to make sure only people who have paid can travel. Modern passports contain them. They are even being implanted in people's arms in Mediterranean nightclubs. By noting the person's credit card number with the tag ID when it is implanted, they can then be used to automatically charge people for drinks so they don't have to worry about their wallet being nicked. Shops are coming up with new ways to use them too. For example, once you have put something in your basket - that skirt maybe - readers around the store can track it. That means if you then wander past a mannequin wearing a jacket that would match your skirt perfectly, it could shout you over to have a look. Of course, there is no reason the shop has to forget about the tag once it has left, and no reason for them to be thrown away with the rest of the packaging, either. If the problem of making them survive a washing machine is solved, the tags could be permanently sewed into the labels. Computers round the shop could then help you find something to match the clothes you were wearing based on the RFID information they transmit as you walk around. There are other possibilities of course. 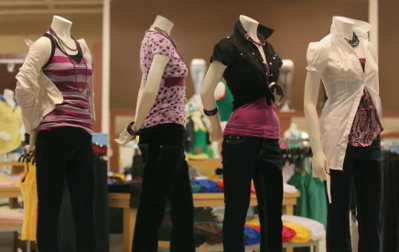 It might also mean when you next returned to Marks and Spencers, having previously bought some of their famous underwear, the shop would immediately notice you were wearing their tights or knickers. Perhaps more to the point it would notice if you were wearing someone else's knickers ... a competitor's I mean, not actually someone else's...you get the point... Anyway, the computers round the store could then work hard at persuading you to go look at their lingerie, offering you discounts to bring you back into the fold maybe. Of course the down side is that you are giving up some privacy with all this RFID use. The shop would knows all about the underwear you wear when shopping. But then you've already given over a lot of privacy already. Shops already can keep track of all the things you buy, transport companies can record every journey you take and search engine companies record all the sites you browse. Perhaps you don't care if they start to log how often you change your underwear too!